From the character of its grand entry, this home displays clever modernistic living blended with stylish sensibility. 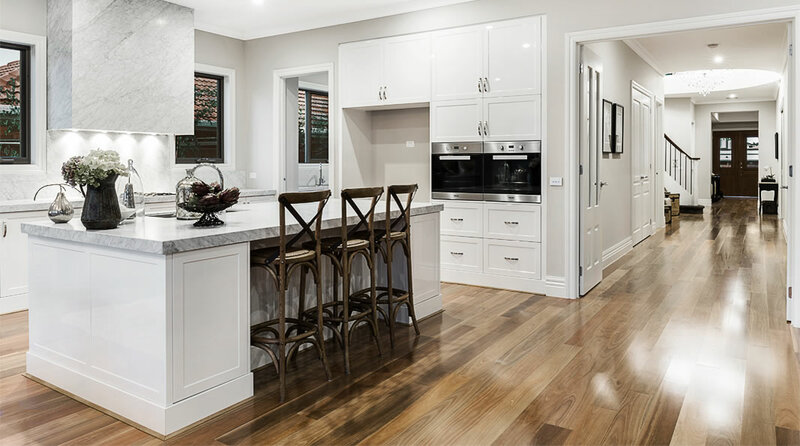 This cleverly designed five-bedroom home has been optimized to deliver a wealth of features, without compromising on space. This intelligently laid out single storey home is a perfect example of distinctive European taste. Compromising three well defined living zones that open up to an expansive deck creating an entertainers delight. Traditional well-defined living zones are blended with modern open plan sophistication to embrace form and capture function. An established period attitude blended with the modern open plan living at the rear of the home embody the stately persona of this design. Combining the elements of its sister floorplan the Belmore 53, the Belmore 62 elevates its presence with an expanded floorplan increasing, the drama.